The Vibox Warrior really is perfect for any serious gamer that are looking for the very best in visual performance. 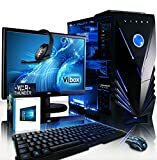 It combines the latest, super fast, Six Core CPU, loads of RAM, a large hard drive and one of the most powerful dedicated graphics card currently on the market, enabling you to play ALL the latest video games at their maximum definition settings providing a simply stunning gaming experience. 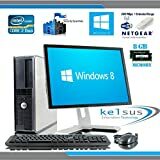 All in all, it’s probably the best gaming setup you can achieve for this price. What makes this system a true GAMING PC is the powerful graphics card inside. This card offers a HUGE performance increase compared to Radeon and Nvidia’s 2015 series of mid level cards and can reach a fantastic 50+ frames per seconds at full HD resolution on the latest games such as Star Wars Battlefront at Ultra quality settings – delivering an incredibly smooth, lag free experience, essential to give gamers the edge over their rivals. With the power to drive today’s (and tomorrow’s) hottest games, the RX 460 keeps you in the fight whatever the circumstances. 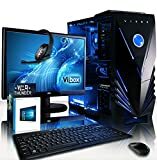 If you are looking for a gaming PC which truly offers affordable, high performance which will keep pace with the latest games for years to come, then this is the PC for you.